As the name HTC Touch Diamond suggests the gadget really gives justice to its name. Actually, this high end mobile phone can become the flag-bearer of this brand. This 110 gram gadget has dimensions of 102 mm x 51 mm x 11.4 mm. This model enhances the factor of comfortablity and communication of the mobile phone users. This gadget also comes supported with HSDPA 2100 and Tri Band networks with frequencies of GSM 900, GSM 1800 and GSM 1900. The display screen of this mobile phone is of 2.8 inches. This spacious colour LCD touch sensitive screen has the ability to support screen resolution of 480 x 640 pixels. Moreover, this gadget comes embedded with 3.2 MP camera. This option helps the users to capture their beautiful and memorable moments. The additional features of camera are auto-focus and dedicated camera keys which would permit the users to directly access the camera settings without going into any lengthy procedures. Furthermore, the video recording option would allow the enthusiastic mobile phone users to record all the fleeting moments at ease. An additional VGA camera also features in this handset to allow 3G video calls to the user. The enticing built-in music player in the HTC Touch Diamond mobile phone, supports and plays tracks of all the popular music files formats such as MP3, AAC, AAC+, WAV, WMA and AMR NB. The music player also plays all the Polyphonic, MIDI and MP3 Ringtones. This widget also boasts of being supported by Bluetooth and the USB port. These options help the users to download and transfer files, songs, pictures from their handsets to other compatible devices. The GPRS, EDGE and Wi-Fi options support the users to enjoy wireless Internet connectivity on their widget. This option also facilitate the handsets to send and receive data at a much higher speed. This model is further compatible with Google Search, YouTube and Wikipedia etc., facilitating the users to access the Internet at a much higher speed any-time and anywhere. The users can send SMS, MMS, Email with attachments and Instant Messages from their device. Apart from these options, this fashionable mobile phone also features a built-in GPS receiver along with the AGPS Navigation feature. This HTC gadget also features Windows Mobile 6.1 Professional Operating system which would help an individual to attach heavily loaded files with the E-mails at a high speed. This widget even has a handwriting recognition feature, which efficiently recognises the user's handwriting without any hassles. 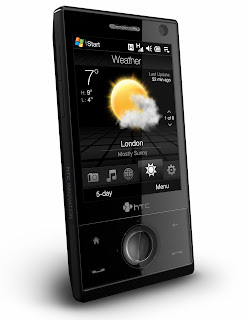 The HTC Touch Diamond handset further comes embedded with 256 MB of ROM, 192 MB of RAM and 4 GB of internal memory. Moreover, with the microSD (TransFlash) card, you can expand the available storage capacity more further. The battery of the gadget when fully charged offers up to 5.5 hours of GSM talk time, 4.5 hours of WCDMA talk time, 285 hours of GSM standby time, 396 hours of WCDMA Standby time and up to 2 hours of video call time. The music player of the HTC Touch Diamond mobile phone supports all the popular music file formats such as MP3, AAC, AAC+, WAV, WMA, AMR NB and so on. Moreover, the music player in this gadget also supports polyphonic ringtones and MIDI ringtones. This smart phone comes equipped with a built-in radio which is supported with RDS technology. There is also an embedded PhoneBook in this gadget, in which one can store their personal contacts. This gadget also has an additional feature such as an Organiser, which can schedule the important works of the isers, a Calendar, an alarm and a clock. There is also a vibration mode feature in this widget which is best suited for the time when the users don't want to hear their ringtone.